This TR6 was previously maintained by the well know Triumph restorer, Bill Hoard for over 20 years. While in his possession he completed the following work: new main bearings, rod bearings; bore job; new pistons; rings; valves and valve guides; new clutch; sprockets; chains; new Dunlop tires; wheels rebuilt; new wiring harness; all seals replaced; gauges rebuilt; new pipes and mufflers. Everything was new, or as new, when bike was rebuilt. 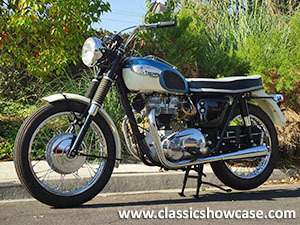 The TR6 is a motorcycle that was made by Triumph, in Meriden, from 1956 to 1973, when it was replaced by the five-speed 750 cc Triumph Tiger TR7V. During this time it was a successful model, particularly in the US. The competition variant, popularly known as the "desert sled", won numerous competitions throughout the late 1950s and 1960s. The bike's appearance in The Great Escape and Steve McQueen's fondness for the model are well known. The genesis of the model came with the introduction of the 650 cc Thunderbird Model in 1950. This was released to meet the demand for higher capacity motorcycles, particularly from the United States, Triumph's largest export market. The success of these models and the 500 cc TR5 Trophy led to the creation of a 650 cc TR6 Trophy model. The TR6 was developed and produced specifically for the US market, in particular, California desert racing. In 1966 the tank badge style changed for the "Harmonica" style to the "Eyebrow". Confusingly the model designators for the US now reverted to TR6R and TR6C. The electrics changed to 12 volt and a bigger 6-pint oil tank added. The front brake drum was redesigned to allow a larger braking surface. 637 TR6’s were made of the 1966 models.